Note the title says “v1.1” but this contains the latest version “v1.2”. SWORT WebAudio (v1.2) is a Real Studio Web Edition control. It adds a audio player to your Real Studio Web Applications. Real Studio 2012r2 or later is required. Some browsers may not play .mp3 files. These are the most common audio files around. You can use .ogg or .wav files for those. But html5 audio tag support is required. This control works best with WebKit browsers. 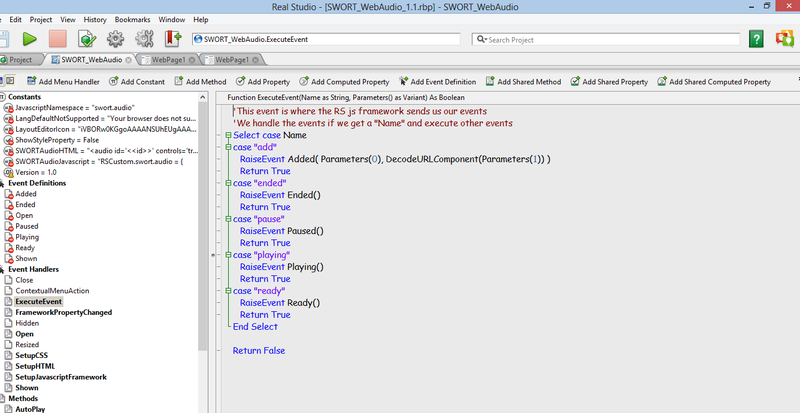 Events won’t execute if they are not used in your Real Studio Web Application. This helps to bring less data from the client to the server and back. For more information and questions you can always contact me, feel free to go to my codecanyon profile.